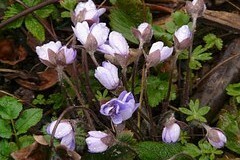 Ground elder, lungwort medical or hepatica - it's just a short list of spring herbs. From the forest herbs in addition to teas prepare tasty vitamin salads or enjoy herbal baths. Bršlica goat leg almost every gardener knows. This plant has a very extensive root system and often do so for growers becomes annoying weeds. But few people know that this particular weed conceals various medicinal effects. Fresh young leaves are used in soups or made into preparing a tasty salad. Appreciated, however, especially the rhizome of the plant from which it produces infusion relieving rheumatic problems and bottom. Bršlica in fact contains a large number of substances that help dissolve and excrete salt from the kidneys. Bath of Bršlica: Tear a 100 g of fresh rhizomes and cook for 15 minutes in 2 liters of water. Then Pour in the water and add water according to their needs. Bršlica bath of goat's legs will be relieved of days. Upon entering the forest lungwort medical attracts primarily for its playful colors. Color blossoms alternating from dark purple to pale pink. As its name suggests, it is an herb widely used currently problems with the respiratory system. "For as P. collect flowering tops, ripping up almost to the ground. When drying, we make sure that the plant was stacked only in thin layers and ventilated places. Dried lungwort are stored in tightly sealed containers. Decoction of healing as P. primarily bronchitis and regenerates the mucous membranes of the respiratory tract, "says herbalist Jarmila Podhorná. Lungwort can also be used in the kitchen of the colorful salads. Salad as P. and primrose: From the flowers and leaves as P. prepare for spring salad, to which we add also the wild garlic leaves and primrose. Season with vinegar, oil and spices to taste. Among the lesser-known and underused herbs ranks and hepatica. It is an indispensable herb caring for liver and gallbladder. Compared with most herbs liverwort collected until the end of flowering, when the leaves have grown. In case liverwort collects whole flowering tops from which prepares decoction to strengthen the liver in conjunction with other active herbs. In addition to use for enhancing liver hepatica is also used for diseases of the upper respiratory tract. Podléškový Tea: We use 2 teaspoons of dried flowers or leaves and pour boiling water. Lyes about 10 minutes and then drain. To improve the problems sip TID.